We have raised a PMR with IBM (#72274,000,834). There is an un-catch null pointer exception bug in WebSphere Portal if “wps.content.template.default” is the first child under Page Templates and it is inactive. Before proceed, ensure that you are using WebSphere Portal CF 9 and above and there are at least 2 page templates. 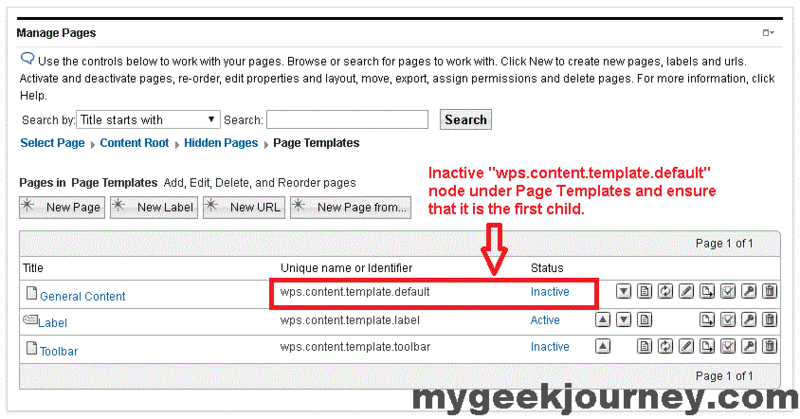 Ensure that “wps.content.template.default” is the first child under Page Templates is inactive and the node is set inactive. Toggle “Edit” mode and proceed to create a child page. Key in the Page’s title and click on the “Create Page…” button. DO NOT SELECT any page template. A “java.lang.NullPointerException” error message will be displayed, leaving the user trying to figure where he/she went wrong.